My second visit (1st under the new Management). Both rooms and public areas very clean; whole building needs updating. Did not see 1 cockroach! Quality of drinks is very good. Good choice of food but found the hot dishes not hot enough - it was pointed out that there is a microwave but I tended to keep to the salads. I did not like the fact that you have to get your own cutlery and queue for drinks; the waiters do not wait; they merely clear the tables & change the cloths. Hardly good service for the rating! It would have been nice to have had a pan & some cups to make a hot drink in the room - there is an oven, hob fridge and sink so it does not make sense. Because it was my 2nd visit the management put a bottle of wine & 2 glasses in the room. We had to go out and buy a corkscrew! Nice thought though. The hotel Isla Bonita was very nice, it was very clean and the gardens and pool area well looked after. The pool was heated in fact somedays it was like taking a warm bath. On the whole, the staff are very friendly but many of the waiters in the dining room could do with a personality transplant! The room was very comfortable,the beds changed regularly and towels changed every day. On the whole, we enjoyed our stay the only negative comment would be that the room we stayed in was 'a little tired'and could do with some TLC. Our second visit to the Isla Bonita and we noticed straight away there has been a change of ownership since our last visit. A few small but crucial details show evidence of cost cutting (previously the ice cream was served in a cone and with a choice of about 15 flavours, now these cones are only available at mealtimes in the restaurant and they have been replaced with the ominous plastic tubs of 3 star establishments and again at mealtimes soft drinks used to come in individual glass bottles they are now draught). Little things I know! So our initial impression was that the hotel had deteriorated slightly. Also, the entertainment team had disbanded a month before our stay and the new team (all agency) were still finding their feet. They were all very friendly and brilliant with our children. The food was fine - a different theme each evening, with a good variety at lunch times. Breakfast couldn't be faulted really. Poolside bar is now self service with a small selection of rolls and olives etc available during the day. The swimming pool (pool A) is heated and during our visit got so hot we thought we were getting in a bath. Several people complained to reception and it was then turned down to a comfortable temperature. Clean and with plenty of sunbeds. The hotel is very quiet at the moment so there was no problem getting a sunbed at any time of the day. The hotel supply towels for the pool/beach so you don't need to take any with you. The location of the hotel is ideal - a short stroll to the beach and shops/bars/restaurants. The maids do an amazing job - they come in every day but sunday. Bar staff were all friendly and are happy to supply as many drinks as you want!! The waiters and chefs in the restaurant are lovely and do their best to make the holiday the best. I would recommend this hotel to anyone and I am sure we will go back. This is graded as a 4 star hotel but I would state it is a 3 star hotel with a 4 star service. Hotel could do with a make over but it was very clean and tidy. We were all inclusive and the food was excellent. Even with 2 fussy children they found plenty to eat. The staff are very good; they do not smile very often but if you worked as hard as them (especially the bar staff) you would not find time to smile either - but they are not rude, just dedictate hard workers. Entertainment is not the best in the world but is passable. 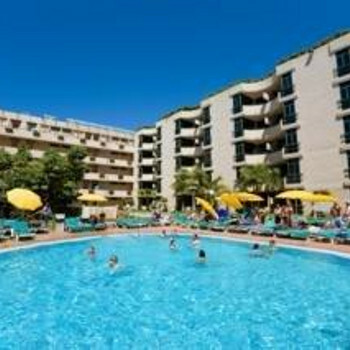 In the Thomas Cook brochure for Winter 2008/2009 holidays they have now graded this a 3 star instead of a 4 - but like I said the service cannot be faulted. First impression was the sheer brutal ugliness - even at night. Similar in appearance to a run-down 1960's council estate. The room was rudimentary but served its purpose - just. The pool areas are in perpetual gloom for most of the day due to the height of the blocks. The reception staff were, to say the least, unhelpful. One in particular was positively rude and appeared to take delight in the fact we had NO HOT WATER in our room all week. In fairness the waiters and staff at the sharp end were fantastic and despite the peak Christmas period, they coped well. The food? Surprisingly good and there was plenty of variety, we couldn't fault it. However, we were amazed to discover on Christmas Eve that the bar closed at 10pm due to 'staff shortage'. What was that about? We saw very little entertainment due to limited space - so I can't vouch for the quality. Overall, the Isla Bonita is just passable as a budget hotel and generally it's clean - but it's a million miles from 4 star. If you decide to stay don't expect deference from the reception staff and keep well away during the day. This was our second time there, last time being 10 years ago.Was so good the first time we always promised ourselves we would go back! Although the hotel is looking a bit tattier than last time, it was still a very good holiday, the rooms were kept very clean with maid service every day, the pools were crystal clear with plenty of sun beds,the food was excellent, my kids even loved it!We were there for 14 nights and we never saw a show repeated. Beware: we were there in peak season and the staff were definitely over stretched and a bit ratty, also if you dont like queueing go early for your meals.Also beware of the hotel "in house" photographer, his free photos are not free, it is a time share skam to get you to buy an appartment at this hotel! Hotel was kept very clean. Excellant apartments.10 mins walk to the beach, shops close by. Hotel food catered more for the germans, kids food aweful. Hotel staff very helpful and friendly. Sports for adults and children during the day. Kids club twice a day. Mini disco at 9pm shows at 10.00pm some not very good but who cares because you are on holiday. We never stay at the same hotel twice. We enjoyed our holiday at this hotel. Before I go they have two nice pools but only average size,but lot of sunbeds. Excellent location. Although rooms facing on roadside get woken up at approx 5am with early morning traffic. Rooms - well cleaned & very tidy. Entertainment - This let the hotel down slightly, Kids entertainment 9 - 10 & then adults entertainment not what I expected - was there for week & saw 2 shows & can honestly say these were a bit tacky but the kids loved it. Would I visit this hotel again, probably for a week again but could not stand the entertainment if i was there for 2. Overall a very nice hotel but entertainment could be updated!! !